WWF- Russia would be releasing ten bisons into the wild in North Ossetia during August. The restoration of bisons in North Ossetia is a part of a strategy to re-introduce the animals in the country. The first six bisons arrived in Caucasus from the Oksky nature reserve (Ryazan region) today, after a 2000 km travel. The new arrivals include purebred two male and four female bisons. The animals were released into the quarantine enclosure in the "Turmonsky" nature sanctuary and would be joined by four more bisons, one male and three females, on August 9. 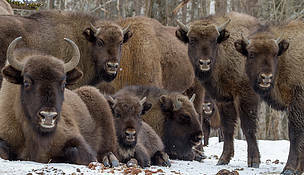 Three out of the six released bisons were born and subsequently transferred to Russia from Sweden while the other three were born in the Ryazan region in Russia. The animals would be released in the wild next month. According to a recent study by WWF-Russia, Turmonsky reserve is amongst the largest forest areas in North Ossetia with a potential to house 300 bisons. This will be the third release of bisons in North Ossetia. Previously, eighteen bisons were released in the region during 2010 and 2012. Today’s bison release is an important and significant event for the animals and for the nature of the Caucasus region - says Roman Mnatsekanov, senior project coordinator of WWF-Russia’s Northern Caucasus Regional Office. Two years of work and a long journey of the animals from Sweden to Russia is behind us. Now our bisons have finally arrived in their new home where they will become the founders of a new group of purebred bisons, filling the missing piece of the ecosystem of the Caucasus region. As per the latest census on bison population conducted by North Ossentian Nature reserve with support from WWF-Russia, the number of bisons in Ossetia has exceeded 80 after the restoration efforts. By the end of the 1990s, the population of wild bisons in the Caucasus had almost extinct with less than 200 bisons left in entire Russia. In 1996, WWF started a program to increase the bison population in the forests of the European part of Russia. As part of the program, 60 animals were brought to Russia in between 1999 to 2002, some of which were kept nurseries to increase genetic diversity while the majority of the animals were released in the Orel-Bryansk-Kaluga region and Vladimir region to restore the specie in the European part of Russia. As a result, 7 groups of bison were created in Orel, Bryansk, Kaluga and Vladimir regions. In 2008, WWF began practical actions to conserve and restore bisons in the Caucasus. Today, more than 600 bisons inhabit the wildlife parks of European Russia.